Meet Hudder the Swainson’s Hawk /Hawks Aloft Inc. Through our many education programs offered each year, Hawks Aloft educators reach thousands of students and teachers in the Albuquerque area. We are always accompanied by our Avian Ambassadors who make our job easy. 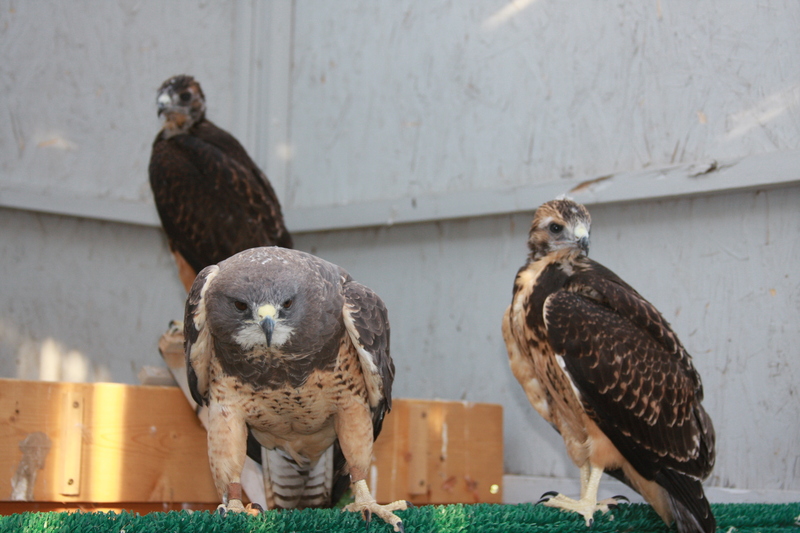 These non-releasable raptors never fail to captivate any audience and help us teach conservation. Each week we will be profiling one of our education birds to help our readers get to know and love them as we do. This week, we are featuring one of our Swainson’s Hawks: Hudder. Hudder poses for a photo by Doug Brown. 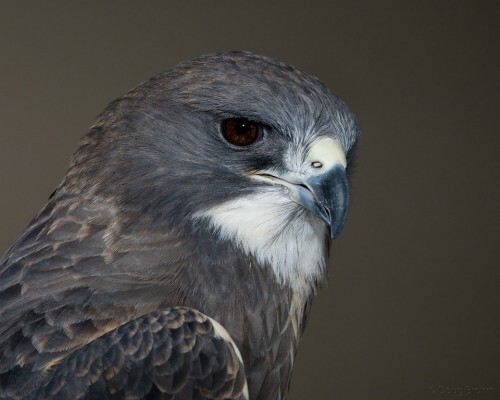 Hudder (or Hudson) is a female Swainson’s Hawk (Buteo swainsoni) who was hatched in 1989. 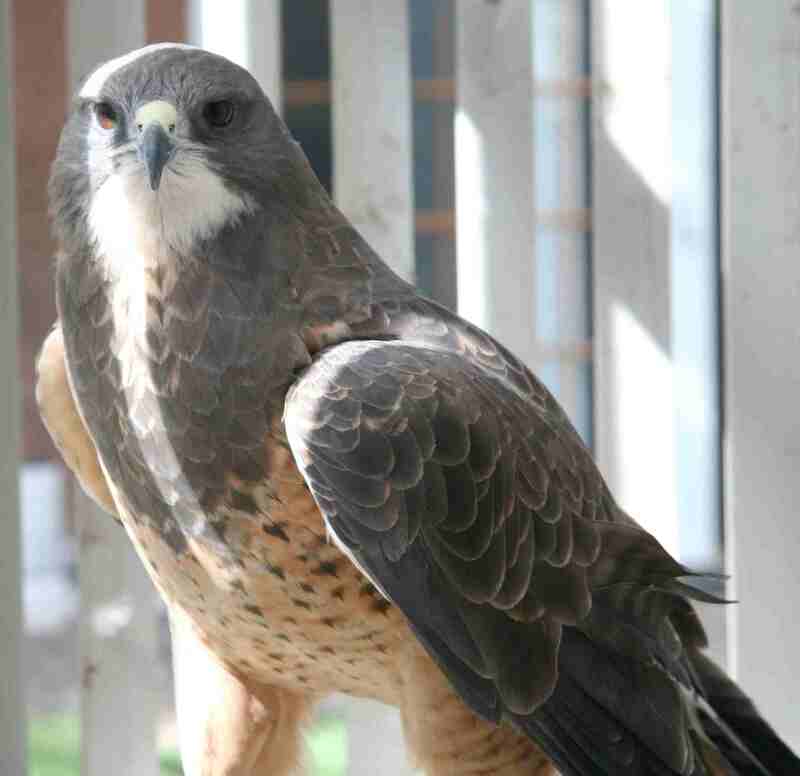 At 23 years old, she is one of our oldest birds here at Hawks Aloft, but is still one of the favorites at events. Her calm demeanor and attentive nature make her great with all ages. Enjoying a little sun in her mews. Hudder was brought into Wildlife Rescue as a juvenile with injuries that suggested a car strike. She has a fractured left wing that never healed and a permanently fixed pupil in her right eye. These injuries probably occurred when her left wing hit a car, causing her to spin and hit her head on the right side. As a result, she flies poorly and has limited vision in her right eye making it difficult to find her perches. Each spring, Hudder builds a nest in her mews. Despite her injuries, Hudder is one of our star foster moms. Each spring she builds a nest and sits on it, awaiting the hatching of her unfertilized eggs. Rather than remove the eggs, we leave them in her mews, keeping her maternal instincts strong. Most years, her hard work is rewarded with a foster chick or two. 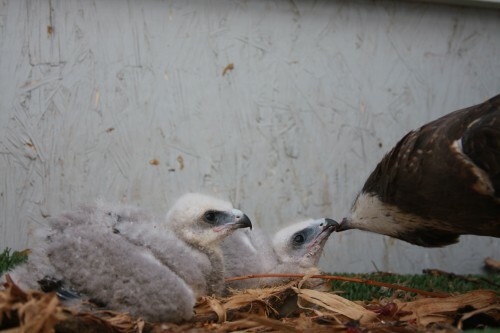 She feeds them, cares for them, and teaches them how to be Swainson’s Hawks so that, when they are grown, her foster chicks can be released into the wild. Our star foster mom dutifully feeds her 21-day old foster chicks. Swainson’s Hawks have one of the longest migrations of any American raptors, with some individuals traveling over 10,000 km (>6,200 mi) from Canada to Argentina. In their wintering grounds in South America, they feed primarily on insects, making them very susceptible to pesticide poisoning. 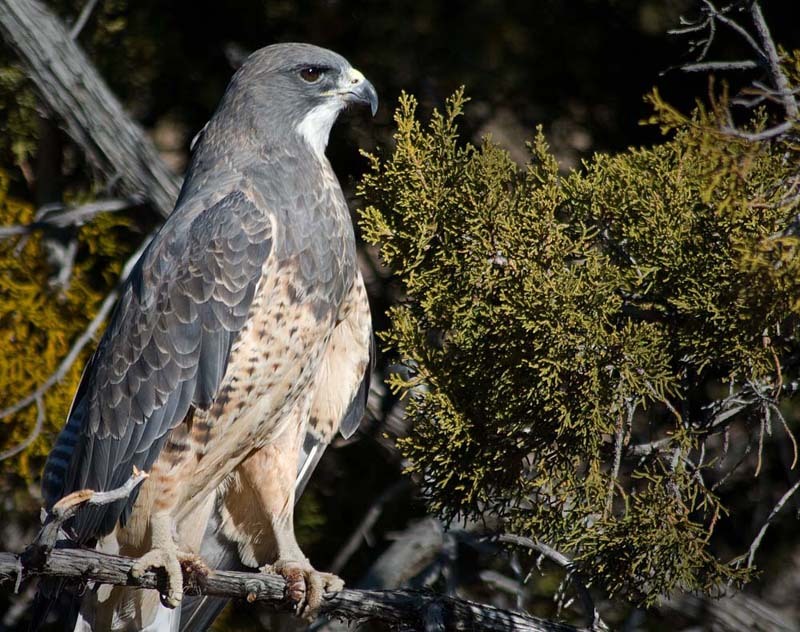 In 1995 and 1996, an estimated 6,000 Swainson’s Hawks died due to the use of the organophosphorus insecticide, monocrotophos, which was used to control grasshopper populations in agricultural fields. Hudder keeps her foster chicks safe & sound, even when they become nearly the same size as her! US & Argentinian government intervention along with radio, television, and popular media awareness campaigns, helped to almost eradicate the use of monocrotophos in the Swainson’s Hawk range and deaths from pesticide poisoning are becoming more and more rare. 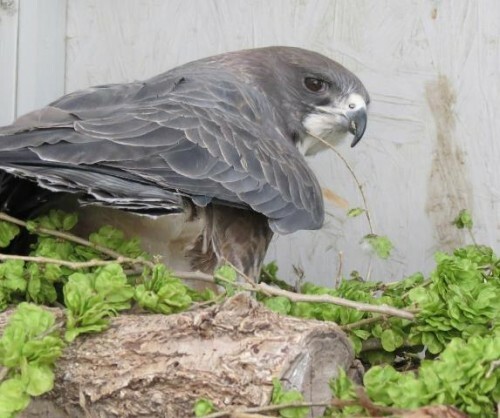 Good news for Swainson’s Hawks. In the wild, Swainson’s Hawks are particularly susceptible to pesticide poisoning.